Is it possible this issue has been solved together with all the other bugs I solved since 0.11.2? Yes it's now much better and I don't know if that's not related to wood somehow, if it's not present in DM storage maybe than Imps won't use it to finish structures? Most of my unfinished structures have all needed resources except 1 or more likely 2 unit of wood, however I had still about 10-20 units of wood in Storage room (and if you look at the pictures above all of these object needed wood, other not and were finished). After loading the game most of these object were finished. Maybe there are so much wood-related tasks they finally got cancelled? And that was also the cause why Imps didn't finish some works before, because there were so much tasks game was not able to have more room for more tasks and deleted old ones? Because this bug report i a little bit to general now, it was definitely valid before when we had so many issues. If this start occurring again its probably because there are another bug somewhere we need to find, and I don't want users to post here and avoid being detailed about it. Its better they make a new post then. Still exists in 11.12, on my second game since 11.11 I had not having 1 unit of stone delivered to a one Imp bed and 1 farm land (again a one tile of farm land, but this time lacks of 1 unit of rock not 1 wood), this is really a mystery. Where is Mello that could confirm this? I was able to reproduce it. You see I never build a storage room next to the Dark Mother myself. But when I built it like you did it was pretty easy to reproduce. Then after an hour of debugging I found that the fetch Item job connected to the storage room wasn't connected to the whole level joblist which it should be. Otherwise non-room workers can't know about the job. I see. Mello also used storages for production chain, maybe not so close to DM, but DM was also not participating in production chain, but storage rooms instead. I tried to make the idea of Receptions put into practice so I've built those storages to see how would that work if all rooms have their own storage room connected with other rooms. This is great you found the issue. I'm really curious how will game behave after solving this issue with and without storage rooms participating in production chain. This was a really though one!! I think I've spent 5 hours total just looking through code and following different paths just to find dead ends. The thing is that this part of the code that handles item deliveries are really complex because there are so many things that can go wrong along the path. So my goal here was to find what went wrong, and how to pause the code when something has gone wrong. I couldn't find exactly why it went wrong, but I found when something went wrong. One 'BuildJob' - Renders construction site and have information about what is being built. One 'TakeItemJob' - The 'BuildJob' has the 'TakeItemJob' job as a child, and it tells the 'TakeItemJob' what items it needs to be constructed. Several 'GiveItemJob' - The 'GiveItemJob' is handled by the storage system and is creating these job on the demands of the 'TakeItemJob'. So the 'BuildJob' tells the 'TakeItemJob' that it needs five 'RockItem'. Then the storage system listens to the 'TakeItemJob' and assigns five 'GiveItemJob' together with the five 'RockItem' in its storage and link these jobs to the 'TakeItemJob'. Each of these five 'RockItem' are also given a pointer to the 'TakeItemJob' so that when a Imp then pick up one of these 'RockItem' he then automatically gets assigned to the 'TakeItemJob' which makes the Imp deliver the 'RockItem' to the 'BuildJob'. So that is how it all gets assigned. So the imps are then listening to the 'TakeItemJob' and checks if this job has any 'GiveItemJob' assigned to it, and that the Items assigned to the 'GiveItemJob' also have a pointer back to the 'TakeItemJob', and if all this is correct then a Imp can get assigned to one of the 'GiveItemJob' and thereby go and pickup the item, and when he has picked up the item he will automatically get assigned to the 'TakeItemJob' and thereby delivering the item forward to the 'BuildJob'. The issue was that sometimes it happened that the 'RockItem' lost the pointer to the 'TakeItemJob' and therefore the job wasn't available. 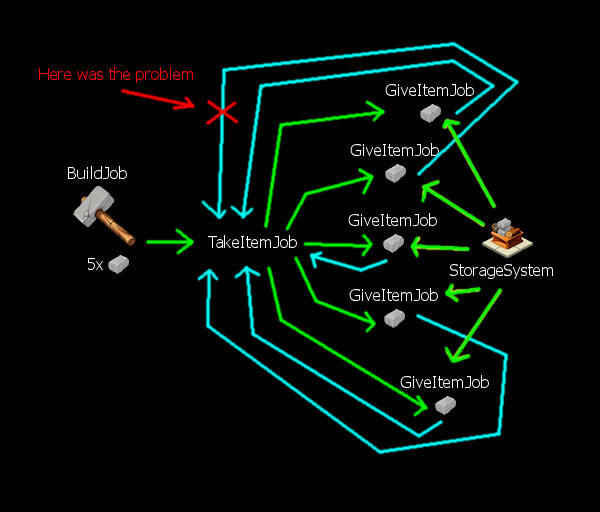 So what I did to solve it was that if the storage system has a 'GiveItemJob' with an Item that are missing a pointer back to the 'TakeItemJob' then the 'GiveItemJob' gets deleted. And by deleting the 'GiveItemJob' the storage system will automatically assign a fresh 'GiveItemJob' to the 'TakeItemJob', just like it would do if you saved and reloaded the game. Very nice explanation. The case of game 2 and 3 is also solved. Only from 1 left. Lemon Head from Steam Wrote: Around the portal you can see tree's your meant to actually be able to cut down the tree's with the little imps for wood, but right now it doesnt work. It seems this issue still exists in 0.11.15 version. EDIT: I noticed that crafting items weren't transported from any storage or DM, but after loading the game they began to be. I've fixed both issues you pointed out, but I remember there was another issue as well regarding enemies popping up out of nowhere on the surface, but I couldn't find that topic. Nevertheless, all bugs are fixed! I think that's solved, fantastic!